For our anniversary this year, Shawn took me to a kaiseki restaurant. Kai·se·ki (kīsekē) is a type of Japanese cuisine comprised of a bunch of small, elaborate dishes. As excited as I was to find out what this was all about, there was still a tiny image floating in my mind of my raiding the fridge as soon as we got home. That actually never happened. While the portions were dainty, our waitress got quite a workout between the kitchen and our table. Of all the artfully prepared dishes, the one that made the biggest impression on us both was a nod to Italy, an earthy truffle mushroom pasta. I just could not get it out of my mind and thought to recreate it at home. So began the search for truffles. Akin to mushrooms, tartufo, as they are called in Italian, grow underground, among the roots of certain trees. There are two kinds, the mild black and more pungent white. Traditionally, dogs and pigs are used to sniff out these hidden gems, but dogs are preferred to pigs who often eat the prize. Difficult to grow and find, fresh truffles are a luxury ingredient easily dismissed if you intend to send your child to college. And, that, we do. Working portobellos into the mix, the result of my little experiment was an elegantly simple comforting dish using few ingredients, bursting with flavour. 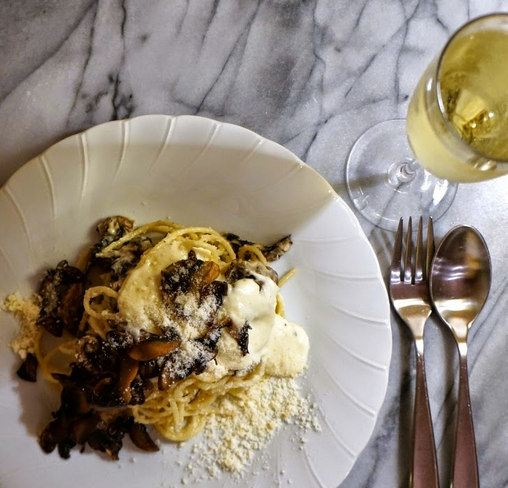 Truffle Mushroom Pasta promises to make you look like a rockstar in the kitchen. A handful of simple ingredients take turns stealing the spotlight and get along beautifully together. Sauteed mushrooms, garlic, parmesan cheese and a simple cream sauce made with truffle butter (available at Whole Foods and other specialty gourmet shops). If you can’t find the truffle butter, order a jar of tartufo carpaccio (shaved truffles) online. Trader Joe’s also has a delicious Himalayan salt with fragrant bits of black truffle that everyone can afford. Hold on to your hat, Cowboy, because you are about to get a real shock. This is one of those recipes that magically whirls a few pantry staples into something stellar. Meatless Monday just got a haute makeover. Notes: For a lighter sauce, use milk instead of heavy cream. Also, I prefer black truffles, but the butter is available infused with white truffles. Try both to see which one you like better. For the pasta, I often reach for angelhair, but you can use any kind you like. Just adjust the cooking time according to the instructions on the package. Drizzle a bit of olive oil into a pan set on low heat. Add to pan and sautée slowly, stirring occasionally. In a small saucepan, toast flour, stir to avoid burning, ~2 minutes. Add butter and stir until creamy. This is the roux. Slowly stream the milk/cream into the center and stir to incorporate. Add garlic and cook until thick enough to coat the back of the wooden spoon. Fill a pot with water and add a tablespoon of salt. Cover and set onto medium heat. When the water reaches a rolling boil, add the pasta. Cook ~5 minutes, al dente. Pour sauce over the pasta and gently stir to coat. Divide among 4 bowls, top with mushrooms. Garnish with fresh chopped parsley and serve with rustic bread. Comforting and creamy, this earthy truffle mushroom pasta dish comes together quickly. So it makes the perfect venue for a weeknight meal, especially Friday night when there is little energy for an elaborate menu, but lots of reason to celebrate the end of the week. Mushroom Pasta in Truffle Cream Sauce guarantees to earn smiles even from those carnivores in your life. It is easy to adjust to feed a few or a crowd and because it is vegetarian, Daphne, my piggy, will be most pleased. WOW! What a gorgeous and elegant dish you have recreated!! Love that it's vegetarian!! What a wonderfully elegant dish you have recreated! I love that it's vegetarian! Hi Coco, love this recipe and the picture with the pig and the plate, mushroom anything for me is a treat! I love your luxuriously vegetarian dish. I love truffles especially their earthy pungent fragrance!!! This must be so yum!